Rami Malek, as Mercury, gives it his best shot but — hampered by a screenplay that seems determined to turn the story of Mercury and Queen into the dullest of music biopics — “Bohemian Rhapsody” too quickly becomes forgettable; something the real-life man at its center never was. Rating: 2 stars out of 4. Take a look online at the real Freddie Mercury, in Queen’s legendary Live Aid performance in 1985, and you’ll realize what an uphill climb the movie “Bohemian Rhapsody” faced. Mercury, the group’s charismatic lead singer, was lightning in a bottle; a consummate performer able to play audiences like a guitar. In video footage of the event, he flings his lithe body around the stage as the music and the roar of the crowd swirl around him, strutting and dancing and posing; it’s as if he’s both performing the songs and becoming them, letting out what lives inside of him. Whether Queen matters to you or not, you can’t help responding to the sly joy of the performance, to the way this wildly talented man is reaching out and pulling you toward him. 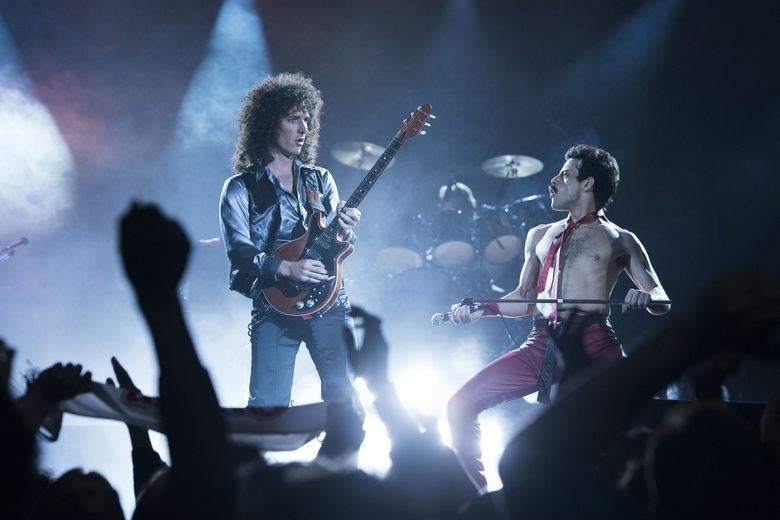 Taking on the impossible task of re-creating a force of nature, Rami Malek as Mercury in “Bohemian Rhapsody” gives it his best shot, and there are moments in the concert scenes where he gets close to the electricity that Mercury exuded. But for most of the film he’s hampered, by a set of prosthetic teeth that mirror the real Mercury’s overbite but seem an uncomfortable distraction (for Malek and for us), and by a screenplay that seems determined to turn the story of Mercury and Queen into the dullest of music biopics. Starting with the Live Aid appearance, “Bohemian Rhapsody” quickly reels backward to a young Mercury, then known by his real name of Farrokh Bulsara (born in Zanzibar, he came to England with his family as a teenager) working by day as an airport luggage handler while trying to get a frontman gig with a band. Things unfold in a too-neat three-act structure — success, trouble, success again — in a way that doesn’t always mirror real history (the movie has the band reuniting after a long breakup for Live Aid, when in fact they had just returned from a world tour) and often has the blandness of a committee-written press release. Pretty much everyone in this film is a cipher, particularly Mercury’s bandmates. 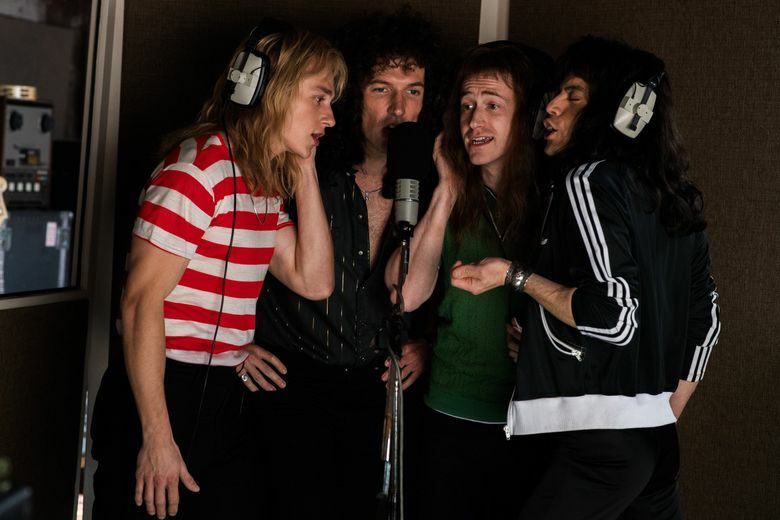 Guitarist Brian May (Gwilym Lee), drummer Roger Taylor (Ben Hardy) and bass guitarist John Deacon (Joe Mazzello) become a trio of genially indistinguishable dudes, peering out from beneath their mountains of hair to express frustration with their colleague’s excesses. And the complexities of Mercury’s identity — race, sexuality, personality, musicianship — get glossed over; he just becomes yet another self-destructive, self-absorbed rock star. Except for its songs, “Bohemian Rhapsody” too quickly becomes forgettable; something the real-life man at its center, who died of AIDS-related illness in 1991 at the age of 45, never was. Watch the real footage; you’ll see. ★★ “Bohemian Rhapsody,” with Rami Malek, Lucy Boynton, Gwilym Lee, Ben Hardy, Joe Mazzello, Aidan Gillen, Tom Hollander, Allen Leech, Aaron McCusker, Mike Myers. Directed by Bryan Singer, from a screenplay by Anthony McCarten. 135 minutes. Rated PG-13 for thematic elements, suggestive material, drug content and language. Opens Nov. 2 at multiple theaters. This story has been updated with the correct year of the Live Aid concert.